Bettina Stanford Cousar works with companies to manage the risks associated with regulatory policies and compliance. 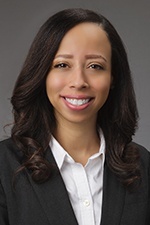 She has extensive experience litigating regulatory matters in administrative hearings, including alternative retail energy suppliers (ARES) enforcement actions, rate cases, approval of energy efficiency plans, and reorganizations and reconciliations. Prior to joining Hinshaw, Bettina worked for both the Illinois Commerce Commission (ICC) and the Office of the Illinois Attorney General. During her tenure with the ICC, Bettina advised Commission Staff on a wide range of legal issues, including evaluating utilities' and ARES compliance with the Illinois Public Utilities Act and the Illinois Administrative Code. As an Assistant Attorney General for the Office of the Illinois Attorney General, she investigated complaints alleging violations of the Illinois False Claims Act and Insurance Claims Fraud Prevention Act. In addition to advising state agencies facing False Claims Act litigation, Bettina participated in multistate litigation and arbitrations. While attending law school, Bettina was a Judicial Extern for the Honorable P. Scott Neville, Illinois Appellate Court, First District. Active in a number of societies and activities, she also served as the Administrative Editor of The John Marshall Law Review.